The Saints Way starts in the heart of Padstow at St Petroc’s Church the original Celtic Monastery at the head of your Cornwall Coast to Coast Adventure. 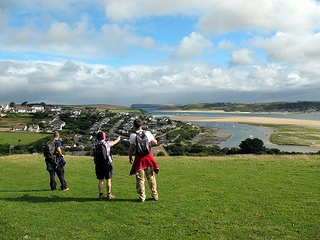 Having explored Padstow’s harbour you leave the fishing and Rick Steins Restaurants behind you and climb quickly to ascend Dennis Hill with its dramatic granite obelisk and rewarding views back over the golden Camel Estuary and rugged north Cornwall coastline. The Saints Way then picks its way along hidden inland creeks and pills along an old sanding track linking old silver and lead mines to the creek head hamlet of Little Petherick with its 14C church. Climbing away from the estuary you now enter the gentle meadow and pasture of the Mellingey Valley passing through ancient manor settlements such as Blable or the “Wolf Pit”. A long steady climb follows onto the higher ground to climb to St Breock Down, the highest point on the Saints Way path at 700ft. Huge Bronze Age Tumuli and Barrows are flanked here by surreal giant whirring turbines at the St Breock wind farm and at the summit you reach Men Gurta Longstone Cornwall’s largest standing Menhir – otherwise known as the Stone of Waiting. Over the down the way drops into the delightfully hidden valley of Tregustick moving onto ancient stony drovers lanes that cross the Ruthern River or Red River named after its unnatural colour - a result of its tin mining past. 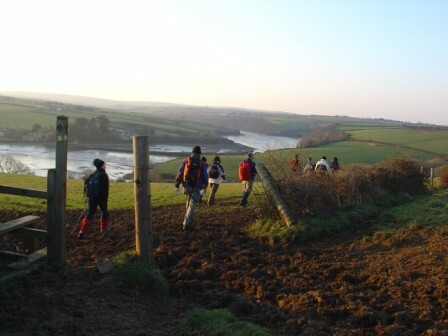 For those walking the Saints Way over three days your first overnight is here in the remote parish of Withiel after 10 miles – with a scattering of farmsteads a 14C Church and little else you already feel a long way from the hustle and bustle of Padstow. 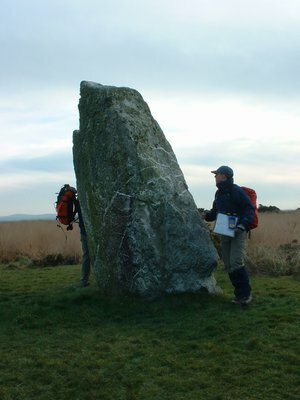 For those walking onto Lanivet on the two Day Saints Way route, you continue through rich pastures and backlanes passing more well preserved Celtic crosses and stone clapper bridges on an easy final 5 mile wander to drop into the village of Lanivet. Lanivet meaning Pagan Sacred Grove has a couple of B&B’s the all important pub as well as a fish and chip restaurant and a shop. So on this trail it’s something of a hub of civilisation. The Church is well worth visiting with several inscribed stones and crosses one carved with the slightly disturbing figure of man with a tail.